The color of your skin helps determine the settings required for tattoo removal. 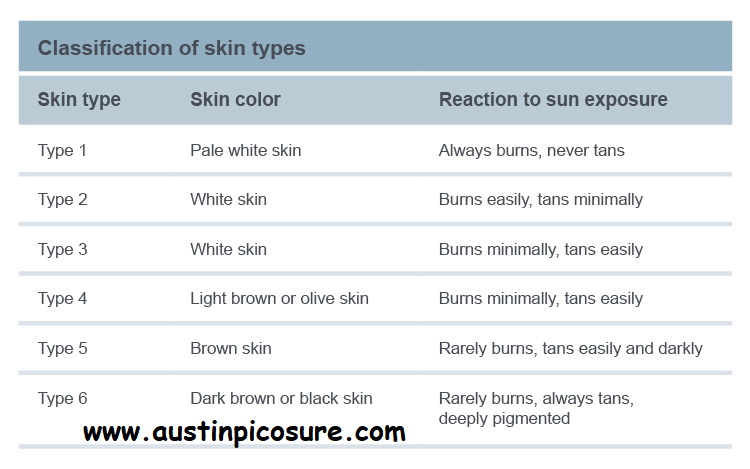 Skin color can be categorized using the Fitzpatrick skin type standard, which was developed in the 1970’s. It measures the amount of pigment in your skin and your skin’s reaction to sun exposure. The biggest risk in tattoo removal is PERMANENT hypopigmentation (a lightening of the skin caused by the destruction of melanocytes). The darker your skin, the higher the risk. Africans and other people with skin types V & VI are at the greatest risk, which I would estimate to be higher than 50% probability. Skin types III & IV are at medium risk but if they’re actively tanning the risk is significantly increased. Skin types I & II have the lowest risk because there’s not much melanin for the laser to interact with. The number of treatments required to remove your tattoo directly correlates with permanent hypopigmentation risk as well. Patients who have undergone more than ten treatments, especially if they’re using a POS q-switched laser, will undoubtedly have some level of permanent hypopigmentation.